This season’s a great time to experiment with different kinds of cuisine, but a recent experience in Bistro Filipino taught me that if you have 7100 islands to get different flavors to get from, wouldn’t it be best to experiment with our local cuisine? At Bistro Filipino, chefs Rolando Laudico, Myrna Segismundo, and Jill Sandique showed us the 7100 different flavors that we can taste. It was my first time to attend an event where a full menu was laid out before me. 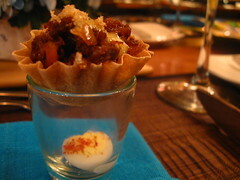 Spicy Sisig Basket in Mini Crispy Rice Baskets with Quail’s Egg and Crispy Pork Rind. 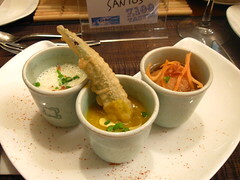 A trio of soups to represent Beef Nilaga, Adobo, and Pinakbet. 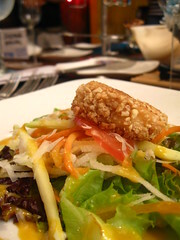 A salad using local ingredients such as mangoes, kesong puti, and kasoy. A granita of tamarind. Lapu-lapu and Prawns in Coco-Lambanog Sauce, Coriender, Asparagus, and Fennel Cherry Tomato Sofrito Brown Rice with Sun-Dried Mangoes. 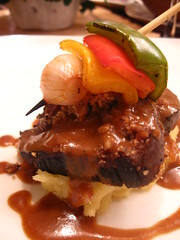 Crusted Wagyu Beef Fillet Cashew-Humba Sauce. 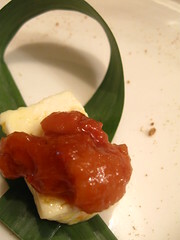 Kezong Puti with Guava Confit with Calletas. And Pili Sansrival and Mango Canonigo. The menu’s quite a mouthful and so are the dishes. They were quite familiar and yet entirely different to my palate. One of the interesting things said that night came from Chef Myrna Segismundo wherein she shared to us the reason why the chefs presented these familiar dishes differently. She voiced that it has always been an issue how our cuisine can never get international acclaim. She then figured out that it’s because we don’t have the proper practices with our cooking. We just love to throw out ingredients together and start stewing. For her, she mentioned that for a cuisine to be recognized, there should be an application of the best practices and techniques. It doesn’t intend to change the recipe but rather have a more uniformed technique in preparing the dish, making what we have something that is beyond lutong bahay (home cooking). The dishes the chefs served to us were great examples of these familiar recipes made and created with the best international techniques and practices. Laudico even says that it’s not exactly fusion custion. 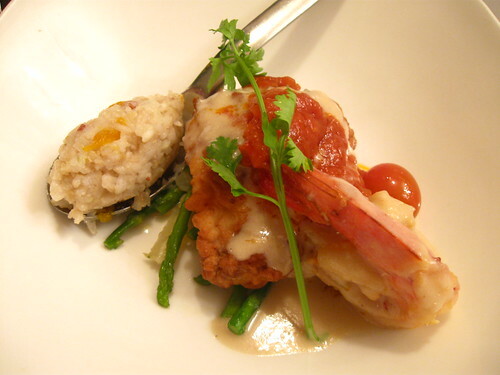 It is still Filipino cuisine just done and presented in a different way. The meal we had in the restaurant was quite exquisite. One of my favorites was the coconut milk dish that had a shot of lambanog in it. It’s similar to how they use white wine in European dishes. In this dish, the lambanog gave a nice heat to the dish and it didn’t overpower the coconut at all. Another notable dish was the sisig in a crispy basket. The shot of quail egg afterwards has that nice texture much like an egg cracked over a sizzling plate of sisig. The dessert was quite impressive as well. 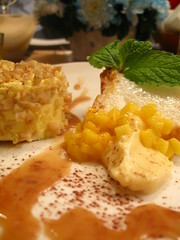 The Mango Canonigo was not too sweet and the cake was well-balanced with the mango. The chefs really put up a great menu for us who were curious to experience 7100 flavors from our country. 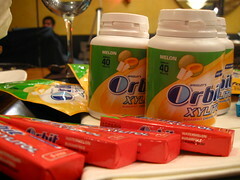 It was even greater that we could clean out our palate with a nice chewy gums from Orbitz. These gums are sugar free and they’re nice enough to clean your palate without having to affect what we’re going to eat next. I want to thank Orbitz for giving us a chance to experience these great flavors! And thanks to the chefs for a great meal! Gorgeous pictures~ I would love to eat there someday! The coconut + lambanog combo, especially, pinged me a lot.